Published: Dec. 23, 2018 at 03:36 p.m. Published: Oct. 21, 2018 at 09:38 p.m. Published: Sept. 23, 2018 at 02:18 p.m.
Cincinnati Bengals quarterback Andy Dalton tricks the Carolina Panthers defense and throws to Cincinnati Bengals tight end C.J. Uzomah for a 1-yard touchdown against the Carolina Panthers. 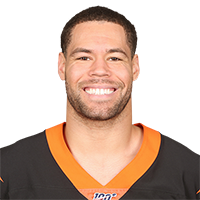 Published: Dec. 24, 2017 at 03:18 p.m.
Cincinnati Bengals QB Andy Dalton hits wide receiver C.J. Uzomah for the big 2-yard touchdown.